It looks like the Rangers started to snap out of their recent doldrums thanks to a visit by the defense-impaired offensive juggernaut known as the Washington Capitals. 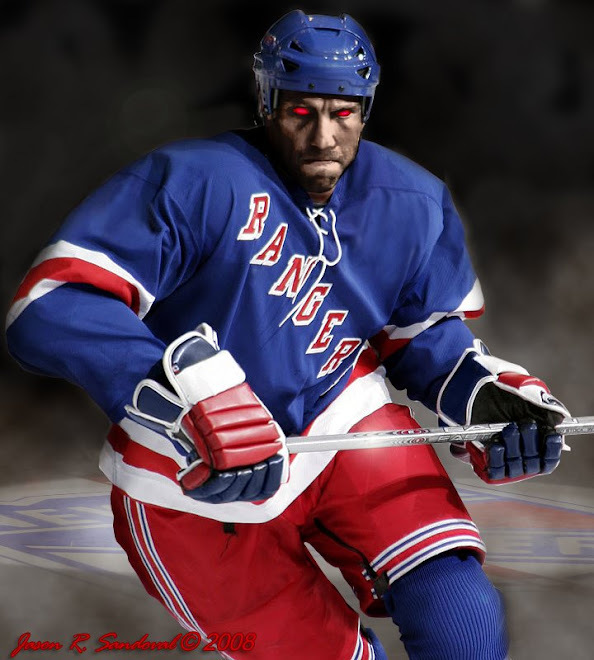 Say what you want about the Rangers generally this season, when they play Washington, you will be entertained. 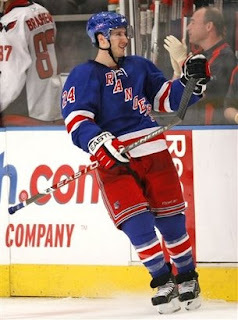 Wednesday night, the Rangers exceeded their scoring for February by scoring 4 goals in the 5-4 shoot out win. The official recap is here. Ryan Callahan after his shootout winner. Beautiful goals were scored by Callahan (assisted by Korpikoski) and Naslund (helped by Gomez) both on rushes toward (or in Naslund's case, into) the net. Korpedo scored thanks to a nice set up by Staal and Callahan. Mara scored on slap shot. So the scoring came from all over the ice. The 3 goal scoring outburst quieted the crowd that kept complaining or moaning audibly when the Rangers had a breakout and then would dump and change. Also, I cannot begin to count how many times I saw 3 rangers converge or collide on the blue line during breakouts. Don't they practice this? This is not your Detroit Red Wings. Perhaps the Rangers need an air traffic controller as an assistant coach. Henrik had at best a decent game. 2 of the Caps scored when it seemed like the entire team broke in behind the Rangers and took up residence at his doorstep. Henrik's newest friend has to be Mike Green, the prolific scoring defenseman (who set the record last night with a goal in his 8th straight game). I had a beautiful direct view from my section over Green's right shoulder for both slapshots he scored in the 2nd period near the top of the right faceoff circle. He might as well stuck a flag at that spot like Sir Hillary to claim that portion of the Garden ice as his. Henrik went down both times and the shot sailed over his shoulder both times, the second one coming with less than a minute in the period. That killed the buzz of the Rangers scoring 3 goals to take the lead. Terrible. And to think the Rangers drafted Al Montoya over Green. With the scored tied at 4 going into the third period, the Rangers had a great chance to win in regulation when the refs led a parade of Caps into the penalty box. The Caps were a man down for 10 minutes out of 12 minutes in the middle of the 3rd. The Rangers did not score although they had some quality chances in the early penalties. The 4 minute power play – forget it. 9 shots on goals during that period? Hopeless or horrendous, you can choose. The only 2 positives from the power play futility – no short-handed goals, and because two culprits were Ovechkin and Mike Green, the Caps' offense suffered. But, for this night, the game belonged to Ryan Callahan. From his first shift with Korpikoski through the shootout winner, he played a great game. Each had 2 points. They had a chemistry as evidenced by the beautiful feed from the Korpedo to Callahan. Unfortunately, Dubinsky picked a bad game to play like he was lost so that was a sore point on that line. Meanwhile, during the entire game, two men were sitting directly behind me. One spoke to the other in English, while the other responded in what sounded like Quebecois French. The Canadian fell in love with Callahan pronouncing his name with a soft G – Gallahan. Throughout the game, I would not understand a word he would say until I'd hear "Gallahan!" As the game progressed, I heard that name a lot. They would be chatting quietly, and then when Ryan would lead a rush or deliver a hit, all I heard was an exultant "Gallahan" from his newest fan. Needless to say, the elation for Callahan his shootout attempt ricocheted off Theodore's back for the game winner was fun. So for this night, I will honor #24's efforts by calling him "Sir Gallahan." He got the 3rd star, but in my mind, he was the first. And I think my neighbor behind me would have agreed. what do you think about this tdr?